On 28 March, the Centre for Scottish and Celtic Studies welcomed Roger Mason (University of St Andrews) to discuss ‘Patriotic Propaganda during the Rough Wooing: The Complaynt of Scotland (1549)’ for the Third Annual John Durkan Memorial Lecture. 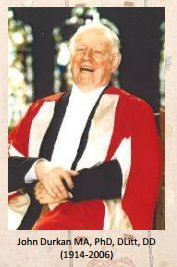 Roger spoke about John Durkan, who he said was particularly encouraging of young scholars, including himself after he had just completed his PhD. Roger stated that while John Durkan did not write on The Complaynt of Scotland, it represents the intellectual world of Renaissance humanism of which John Durkan had uncovered so much. Roger began by providing us with the context in which the Complaynt was written. The Rough Wooing took place after the death of James V in December 1542, when Mary Stewart, only a week old, acceded to the throne. James Hamilton, Earl of Arran was named Regent in 1543. James decided to enter into an alliance with England, by promising to marry Mary to Henry VIII’s heir, Edward VI. This alliance was called the Treaties of Greenwich, but this was quickly rejected by the Scots, led by James V’s widow, Mary of Guise and the Catholic hierarchy. This rejection led to a series of punitive military expeditions ordered by Henry VIII and carried out by the Duke of Somerset against the Scots from 1544-45. When Henry VIII died in 1547, his successor, Edward, was 10 years old at the time. The Duke of Somerset became Regent and showed similar interest in gaining control over Scotland and Ireland to spread Protestantism. Roger emphasized that the Rough Wooing was not only two separate dynasties in conflict here, as there are Stewarts, Tudors, Guises and Hamiltons involved. During this period, issues of ethnicity, identity, religion and nationhood began to challenge these dynastic imperatives which usually drove politics. These themes of identity, ethnicity and nationhood become increasingly prevalent in the propagandist messages of the 16th century. Before his death, James V sought to create a history for Scotland which was separate from England’s history. The finished work was entitled Scotorum Historiae, and was written by Hector Boece in 1527. A vernacular translation was provided by John Bellenden in The Chroniklis of Scotland in 1536. This history was challenged by Henry VIII, in 1542, who declared war and gave his own historical account of Scotland and its dependence on England throughout history, citing tales of Brutus and his sons and King Arthur as evidence. Roger stated that after James V’s death, Henry VIII played nice as he wanted his son to marry Mary. After the rejection, he instructed the Duke of Hertford, who became the Duke of Somerset and later became Regent, to begin punitive actions against Scotland. When Henry the VIII died, Somerset continued these excursions and made several propagandist messages promoting the marriage of Mary to Edward VI. On the night of the Battle of Pinkie Somerset issued the ‘Proclamation to the Scots’ which argued for the creation of a British Empire, specifically one that is Protestant. The same year, 1547, a pamphlet written by James Harryson, otherwise known as James Henrisoun, a Scottish Edinburgh merchant who had joined the English propaganda machine, was issued by Somerset. The narrative was given by a personified Britannia, who emphasized that the Scots were British by blood, that they had a shared history through Brutus and that Emperor Constantine had all of Britain in his possession. Roger said that several Scots disagreed with these unionist messages and many crafted responses to this propaganda. William Lamb wrote Ane Resonyng, and although it was unfinished, he refuted each line of Henry VIII’s history. Lamb was writing while peace was being made, so it is likely that it was abandoned after peace was achieved. This is also around the time that The Complaynt of Scotland was written, presumably by Robert Wedderburn of St. Andrews. His residence in Dundee, where he was a vicar, was destroyed by the English after the Battle of Pinkie. Today there are only four printed copies of the book with no title page. The Complaynt begins with a call for a rally of the Scots behind Mary of Guise against the wolves of England. While it does not specifically attack Henry VIII’s proclamations like Lamb’s Resonyng, it repudiates English sovereignty and states that the English will treat the Scots as they have treated the Welsh and the Irish. Roger argued that Wedderburn mirrored Henrisoun’s Britannia with the character Dame Scotia. Wedderburn rejected the idea of a ‘British’ identity. He drew on civic human classicist thinking and argued that they need to fight for the “common weal”, a word new to Scottish political vocabulary. Roger stated that in The Complaynt, Wedderburn directly translated and essentially plagiarized a 1420s French poet, Alain Chartier’s Le Quadrilogue Invectif, although he infuses concepts with a Scottish inflection and expands on each. He believed it was part of the human condition to protect your freedoms, and that citizens had an allegiance to each other, not just the king. Roger concluded by stating that the Complaynt marks the neologism of “the common weal” and a new vocabulary of identity informed by civic humanist thinking. Scotland began to be viewed as not a kingdom, but as a Commonwealth. This prose represents the fabric of the intellectual world that existed as the Renaissance world was crystallizing. Our seminar series continues 2 May 2017 with a “Fantasy Round Table.” This will be held at 5.30pm in Room 202 of 3 University Gardens. All welcome!